The term Big Data is going to become a key part of the forward-looking business technology debate among informed, proactive and ICT savvy executives. But what's really driving the growing demand for meaningful solutions? While most companies are collecting, storing and analyzing data, they continue to struggle with both the business and IT challenges of Big Data -- more data is not necessarily better. Enormous amounts of data are being generated daily by smartphones, sensors, video cameras, smart meters, and other connected devices, adding to the huge store of information from traditional sources. 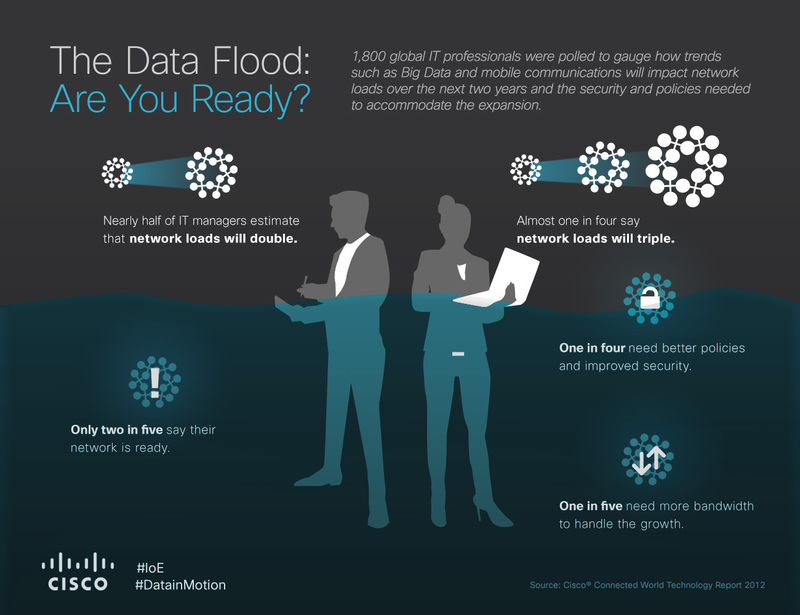 This "data avalanche" represents a potential gold mine of insights, but a new study commissioned by Cisco reveals that IT professionals and businesses are challenged to extract strategic value from their data. The Cisco Connected World Technology Report (CCWTR) surveyed IT professionals across 18 countries to examine the IT readiness, challenges, technology gaps, and strategic value of implementing Big Data projects. While most companies are collecting, storing and analyzing data, the report reveals that many are struggling with both the business and IT challenges of Big Data. For example, while 60 percent of survey respondents agreed that Big Data will help improve decision making and increase their competitiveness, only 28 percent report they are currently generating strategic value from their data. Globally, 60 percent of survey respondents said they believe Big Data can help businesses and countries to improve decision making and global competitiveness, with respondents in China (90 percent), Mexico (85 percent), India (82 percent), Brazil (79 percent) and Argentina (78 percent). the most confident in Big Data project benefits. Over two-thirds of IT managers agree that Big Data will be a strategic priority for their companies in 2013 and over the next five years as well. Scores were highest in Argentina (89 percent), China (86 percent), India (83 percent), Mexico and Poland (both at 78 percent). What's needed? More than a third (38 percent) say that although they have a Big Data solution, they need a strategic plan to take advantage of Big Data. IT managers report several obstacles to adopting Big Data solutions: Security tops the list, followed by budget and staffing. More than one in four respondents globally (27 percent) said data security and risk management is a major concern. They cited the sheer volume of data, the number of ways to access data, and lack of budget for security as the top reasons why securing data in Big Data projects is such a challenge. Security concerns were most prevalent in China (45 percent), India (41 percent), the U.S. (36 percent) and Brazil (33 percent). Together, lack of budget (16 percent) and lack of time to study Big Data (14 percent) are cited by a third of respondents as their main obstacles. Almost one in four (23 percent) said the lack of enough IT staff (13 percent) or Big Data staff expertise (10 percent) as main issues, especially in Japan (31 percent) and Brazil (30 percent).